El Best Western Halton Hills se encuentra en el centro de Georgetown. Venga y disfrute de las mejores atracciónes turísticas cerca de nuestro hotel. Precios bajos garantizados y ofertas exclusivas. Descubra este encantador hotel homologado por la CAA/AAA y situado a las afueras de Toronto en Georgetown/Halton Hills, cerca de Acton, Ontario, y a poca distancia en auto del aeropuerto internacional de Toronto Pearson. El Best Western Halton Hills proporciona un cómodo acceso al estadio Mold Masters SportsPlex Arena, galardonados campos de golf y la mundialmente famosa ruta de senderismo Bruce Trail, situada en el área de Niagara Escarpment. Los huéspedes también podrán disfrutar de un corto paseo en auto a Toronto para visitar el Centro de la Ciencia de Ontario, el zoológico de Toronto, el centro Air Canada, el Centro Internacional de Toronto y el centro CN® Tower/Rogers. 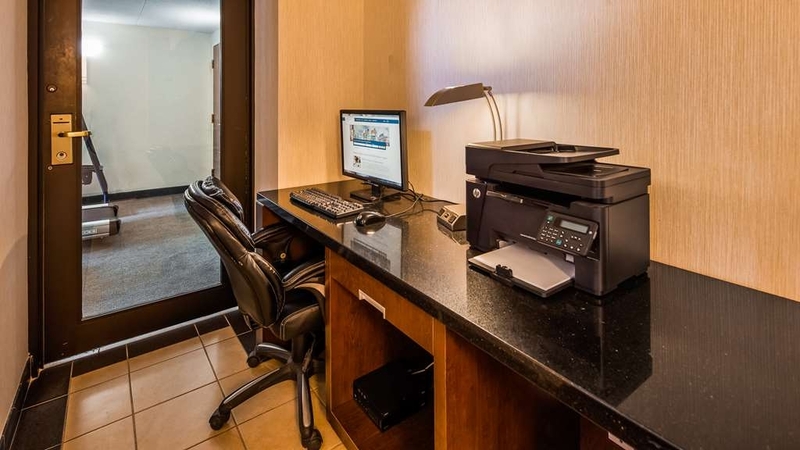 El Best Western Halton Hills ofrece amplias habitaciones magníficamente equipadas con televisión por cable vía satélite y acceso a Internet de alta velocidad. Los huéspedes del hotel podrán disfrutar todas las mañanas de un desayuno continental gratuito con gofres belgas recién hechos. Entre los servicios e instalaciones adicionales de este encantador hotel de Ontario se incluyen un gimnasio, un centro de negocios de servicio completo, salas de reuniones y un restaurante. Los huéspedes que se alojen en este hotel estarán situados a poca distancia del centro comercial de tiendas directas de fábrica Toronto Premium Outlet Mall, las oficinas centrales canadienses de Watchtower Society, el Teatro John Elliot, el centro de artes visuales Williams Mill y el centro comercial Georgetown Marketplace Mall. Los huéspedes en viaje de negocios apreciarán especialmente la proximidad a Saputo (Neilson Dairy), la sede de Mold-Masters Limited, Olon Industries y CPI Canada. Nuestro hotel también se ubica cerca de espectáculos locales como los juegos Highland Games, los espectáculos hípicos de HaltonPlace, los torneos de hockey en el Mold-Masters SportsPlex Arena y otros eventos deportivos. 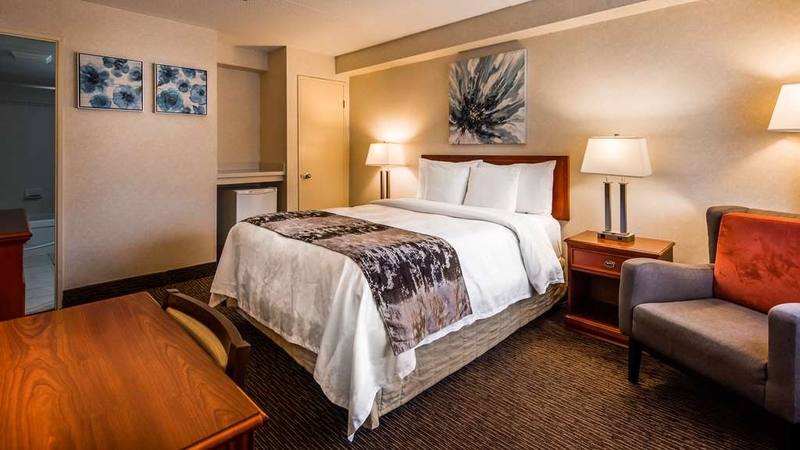 Si desea disfrutar de un servicio de atención al cliente de primer nivel y de una céntrica ubicación, haga su reserva hoy mismo en el Best Western Halton Hills. Número limitado de habitaciones para mascotas. Póngase en contacto con el hotel en el momento de realizar su reserva si tiene previsto alojarse con una mascota. Disfrute de su estancia en nuestro hotel. 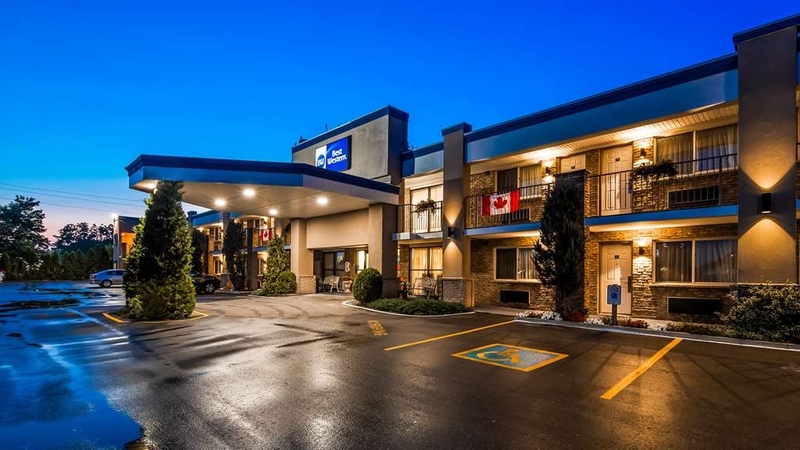 "My stay in Halton Hills bestwestern"
I had a great stay, best western Halton Hills speedy check inn and the rooms were clean and friendly service. The breakfast bar was great good food and coffee. I would definitely stay at this hotel again thanks best western Halton Hills. "Comfortable Rooms and Helpful Staff"
We stayed three nights at this motel when visiting the area for a family wedding. The rooms were well furnished and clean and staff helpful. The complementary breakfast was reasonable. To make the most of the area, where there are a number of pleasant countryside walks, a car is essential. Nice hotel. We stayed there on new years eve given we were in town to visit friends. Very nice hotel, friendly staff, comfortable, would definitely stay there again. Staff was very welcoming upon arrival, room was very clean and comfortable. The bed was very comfortable! The room was large well arranged, very clean. The staff, including reception, house cleaning and those in the dining room were very attentive and helpful. We stayed over 20 nights over a period of 2 months for conferences and each time the experience was good. I spent 8 months at The Best Western in Halton Hills while my home was being repaired. I got to know most of the staff. They were very friendly and no request was too big or small. It truely felt like my home away from home. "AWFUL PLACE TO STAY DON'T GO!" This location in Georgetown is outdated and out right gross.The rooms have cracks and holes not to mention no drainage in the tubs. The carpet is disgusting and smelly and the amount of which they charge you can stay at a 4+ star hotel. My family stayed for 6 nights to accomadate our pets at a higher price and our keys never worked whether morning or evening. We were a family of 4 yet house keeping continued to leave 3 towels daily?? Some of the staff was friendly and others not so much. The management team on the other hand is very rude and can not handle feed back for improvement. If you have children BE CAREFUL.... the environment is not the greatest!!! Dear Jennifer, Thank you for sharing your feedback. I'm sorry that you did not find us to be a good value. Your feedback is welcomed as it allows us to improve. Thank you again for taking the time to share your review with us. "Outstanding value at a very reasonable price"
I encountered a number staff during my stay and to a person, they were courteous and helpful. Forgot my tooth brush & paste but the front desk bailed me out. Rooms were clean, comfortable with speedy internet. "Great Hotel in Georgetown, ON." I was happily surprised to know there was a Best Western in Georgetown. I would definitely recommend it. 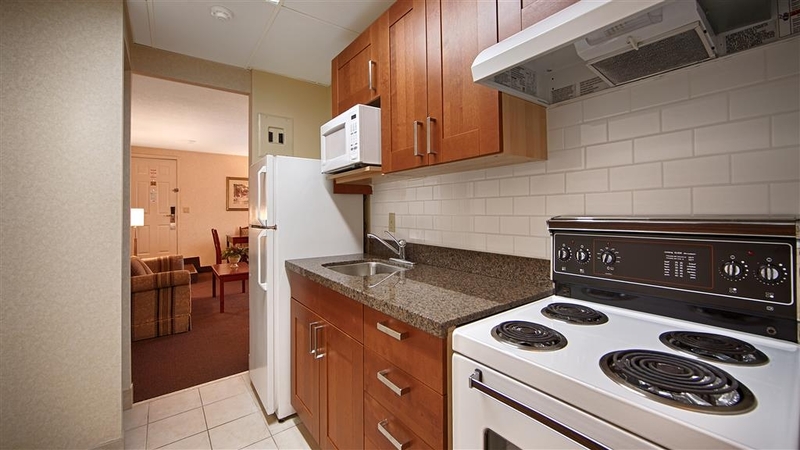 It has everything you need and is near grocery store, beer store, Walmart, pharmacy and restaurants. "very convenient for our needs"
We have family close by who's home is small. When we need extra sleeping arrangements this location is perfect. We have used it a couple times now & probably will stay again around Christmas. Breakfast is a nice touch. This hotel room was average at best. My room had a lot of bugs and the wifi was slow. I didn't report any of the problems as I just preferred to only be in my hotel room to sleep. The bed was very comfortable. I would of liked if I was able to use the recreational facilities but the times were inconvenient. Hi Timitango, I'm sorry that you did not find us to be a good value. We aim to impress, so I'm sorry your stay was just average. Guest satisfaction is our highest priority and I regret that we left you underwhelmed. Your feedback is welcomed as it allows us to monitor and improve. Thank you for taking the time to share your review with us. "Great Getaway! Even for Business"
Wow Angela! Thank you so very much for wonderful review. We are delighted to learn that you had an amazing stay at Best Western Halton Hills. 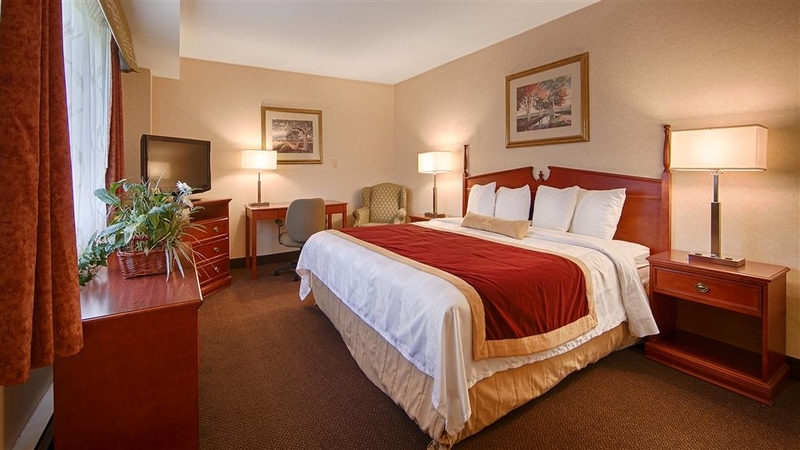 Nothing makes us happier than to see how our guests love our convenient location with clean and comfortable rooms. We hope to welcome you very soon in Georgetown for another exceptional stay. We needed a place to crash for one night. This is a very clean Best Western. Quiet area. Comfy bed and room temperature, The breakfast has hot options and a waffle maker. Fresh coffee. Two luggage holders, coffee maker, tv with lots of channels in the room. There are bright lights outside the rooms, which can be a nuisance for sleeping but we managed to cover the gap with the extra pillows. Thank you so much Jess R, for sharing your feedback on your recent visit to Best Western Halton Hills . We are delighted to know you had a comfortable stay in our newly renovated rooms. We are so happy you enjoyed lovely continental breakfast with wide varieties. We hope to welcome you back in the near future for another wonderful experience. Liked what we saw as we were driving by and stoped to get a room if available. We got a room at a good rate and stayed there for one night. Everything was perfect, nothing to complain, breakfast also had good variety and freshness. I've have stayed at this location many times over the years. Have always met friendly staff, out going to help your request. Rooms are spacious and always clean. Beds are comfy. Quiet place to stay, restaurants and shopping close by. Overall have never had a bad stay. First impression doesn't do it justice because no matter how much they have tried to update it, the hotel remains an old-style motel. Parking in front of the exterior entrance to the room. Nothing fancy and still a bit dated despite apparent renovations but they did a nice job with clean, comfortable amenities. Even some of the fancier hotels I've stayed had moldy tub surrounds but this was spotless. The location was a bit inconvenient for us but fantastic as a freebie on points. Breakfast was basic and decent with various options (scrambled eggs, sausage rounds, various breads, pastries, fruit, cereals, yogurts, non-dairy option, waffle machine, juice, coffee/tea. Everything was clean and comfortable at this hotel. The service was great. Check in and check out was ideal. The bathroom was clean. The breakfast was hot and fresh. Parking is available right outside your room due to the layout. The area was quiet. Wow Lengineer! Thank you so very much for wonderful five stars. We are delighted to learn that you had an amazing stay at Best Western Halton Hills. Nothing makes us happier than to see how our guests love convenient location with clean and comfortable rooms with lovely continental breakfast. We hope to welcome you very soon in Georgetown for another exceptional stay. Be prepared to pay more than your over the phone pre arranged quote and have a fight with the Manager..who is also the Owner. Though he won't tell you. I was quoted a certain non refundable price for 9 days ..flying in for my mom who was dying. Got there had a fight booking in when I was In a hurry to get room settled and get to palitive care. They changed my room and he said he had no other rooms to move me too.. it was ok but by the gym wall downstairs ,I had been told I could have quiet upstairs upon booking . Then came price ..said I had to pay more as I was there on weekend...which the gal that booked me already knew dates. The Manager/Owner Ashik [-] was arrogant telling me he could not give me that price as the owner wouldn't agree..hey turns out he himself was the owner then said he had no time to argue and I could stand at side while he dealt with next person.. I said how would you like this treatment if your mom was dying and you were needing to get settled quickly...( other hotels 40 minutes away). He didn't care apparently. So politely, I waited while he dealt with other 2 people behind me who had no reservations.. and guess what..he DID have other rooms he offered them. The staff are lovely but not treated well either, rooms clean. When I finally checked out...there was another man going thru same thing over his bill upon leaving while his taxi was waiting. Seems this is the norm..TAKE EXTRA CASH !! We are concerned with the nature of this complaint. We do apologize for any inconvenience you have experienced. We take our reservations based on availability. We do our best to honour your room request but it is not a guarantee that we can place you where you want. At the time a reservation is made we always confirm the rate and we will always honour the price you were quoted over the phone. When you arrived, we showed you the room before you officially checked in. We also did a welcome call to your room at around 3pm, and you said the room was great and the WiFi was working fine. 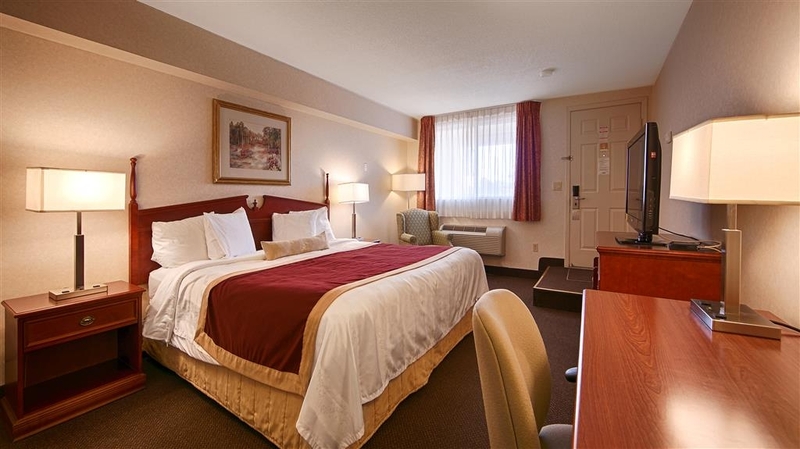 We area small-town hotel and we pride ourselves on being a warm and welcoming establishment. Our entire staff, from the owner down to the landscaper, are a like family and we can tell our guests that this is a family-run hotel. We sincerely apologize if you felt that you were mistreated at an especially difficult time. The room was nice as was the night check in lady. If the morning staff & breakfast that finished us. 1 hour before breakfast is over had to ask if there would be more food as there was very little & 2 of us to eat. The lady/maid/cleaning staff was walking around with a plate of FOOD & talking at the front desk. The front desk lady brought some more food. Then a day time front desk girl comes & there is a gab fiest in the breakfast room. They sat down beside us as if they were guests & we had to listen to all their personal business. Then the 3 of them were around the coffee & we had to ask if we could get some. The food was terrible. Powder eggs. Toaster broken but replaced as we were leaving. Come time to check out the girl was in the breakfast room AGAIN. Had to wait as she ran out. She knew they were doing wrong but so what. We have stayed here 3 times. It has only gotten worse. Problems with breakfast the last time also. I don 't ask for much but don't want to have breakfast with the staff. Didn't know they get paid to visit. What a jog. We will not be going back there again. Will go somewhere where they appreciate the business. They charge more & you feel like you are intruding on their time. Never saw staff take advantage so much. Proper setting, motel style building. Friendly staff, priced appropriately. Lots of restaurants nearby, and shopping available. Parking in front of your room is also handy. Will stay here again in the future. "The manager has a very ignorant attitude. Rude and unhelpful." The female manager is very nasty, unhelpful and argumentative. Seems to like to fight rather than provide customer service. We paid for a foreign guest to stay here and she refused to confirm whether he arrived or put us through to his room, even when the room was on my credit card. She was yelling and being a certifiable loon on the ohone. Total idiot. Do not book a room here if you can avoid it. GO TO STONE EDGE ESTATES BED & BREAKFAST INSTEAD. BEAUTIFUL DECOR, INDOOR POOL, HUGE MANOR HOUSE WITH GORGEOUS GROUNDS AND THE OWNER IS AN EXTREMELY HOSPITABLE AND INTERESTING HOST. Dear Madeline M.; We are dismayed at your experience when calling in! The privacy and security of our guests are of utmost importance to us. Our staff has been trained to not give any information, including if a guest has been checked in unless we have been given permission by the guest to do so. Communication between staff and guests calling in for information can seem “guarded”, and we apologize that this was experienced. We will check in with our staff to ensure a calm demeanor is always at the forefront of every communication. Please note that our front desk staff are a dedicated and hardworking team; I assure you that they want to give the very best customer service! 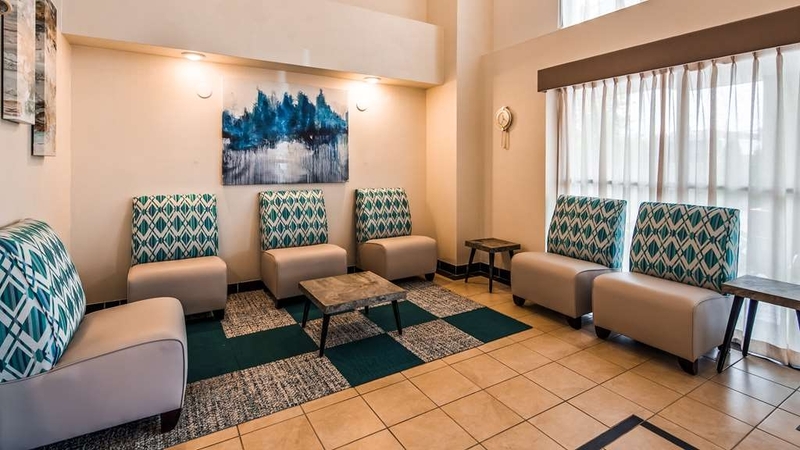 We do hope that the guest enjoyed the comfort of our newly renovated hotel; our complimentary continental breakfast and of course a memorable stay in our wonderful little town of Georgetown. PS. We agree Stone Edge is a lovely Bed and Breakfast if that style of accommodation is what one is looking for:) We like to work hand in hand in supporting and promoting the businesses of our community. "Have stayed at much better hotels"
"Untidy, and manager is an unreasonable and difficult person"
Had difficulty trying to get bookings finalized with the manager. She seems determined to present problems instead of helping resolve them. Rooms are unclean and service leaves a lot to be desired. Bathrooms had hair in the tub and water stains all over the counter. Thank you for taking time to share your experience with us. We apologize for the communication error at the time of your booking, our staff does their best but sometimes there is misunderstanding. We hope that you will find an improvement on your next reservation with us. It was surprising that you found so many problems with the cleanliness of your room. We would have been happy to change rooms for you. It must have been an oversight in putting you into a room that wasn't finished being cleaned! We pride ourselves on having the best housekeepers; please, once again accept our apologies. Best Western Halton Hills wants our guests to know we care. We truly appreciate your feedback. Please let us know during your stay how we can improve your stay. We want you to leave satisfied. "Very pleasant staff and perfect accomodation!" We had stayed here before and note that they have made VERY positive changes! We booked this hotel a month before Christmas Eve and although they do not provide e-mail confirmation, I did get a confirmation number and they called me approximately 1 week before to confirm, nice touch! The room was spacious, clean and just what we needed for our one night stay. Plenty of bathroom accessories, bed was extremely comfortable and SO clean! Most impressive was the staff! The gentleman at the front desk was SO pleasant and helpful. He was the one that also called me a week before to confirm. I like that we can deal directly with the hotel for reservations, much more personal. He explained the Christmas hours and procedures in great detail, explained that there would be no breakfast Christmas morning...understandably! We have had their breakfast before and it was very good. He offered us granola bars and other snacks, which we graciously declined as we were heading out for a huge Christmas meal. He even escorted me to the door and held it open on my way out. We were VERY happy with everything! We have used this hotel on numerous occasions despite constant issues checking in(when reservations have been made in advance). Unfortunately being the only hotel in Georgetown, we continued to stay there. After our last stay, despite it being the only hotel in Georgetown we will never stay again. We had a queen bed room on the ground floor, at the back of the motel. The location was very quiet. The room was clean and well appointed. Comfy bed and pillows. Great shower pressure and temperature. Heating worked well. The bathroom floor was cold, though, as there is no heater in the bathroom. I was happy that there was pure chamomile tea offered in the room. Front desk staff was friendly and helpful. We did not have the breakfast, but it looked pretty standard; cold cereals, toast, and I saw a waffle machine. Overall we were pleased with our stay at the Best Western Halton Hills. "Not Many Other Options in Town"
This is a standard motel, with doors opening onto parking lot. I was in town for business and it was the best option of only a few. Stayed 3 nights. Room had a very strong 'air freshener' scent (strong enough to induce headache), which went away by the second day. There was a mat near the door which looked like it would be used for a pet bowl, so perhaps that's the reason for the air freshener. Housekeeping wasn't great (toilet not cleaned at least one night). One evening I arrived back to the room to find the bed not completely made up (pillows and bedspread on chairs). Response from manager was that my arrival might have caught housekeeping by surprise so they left it (that made no sense as there was no one in the room when I pulled up to the door). Also they responded that hard water makes the toilets appear dirty (also not the issue). I did appreciate the response, and staff was friendly. If there was another option close to my business needs I would have stayed there. Fairly expensive considering the property seems a bit old and run down. service was great but took 4 key attempts to get into the room, the pillows were awful, bedding way too hot. there was NO water pressure in the shower. could not wash my hair as the shampoo would never have rinsed out. Dear Donnalee S, Thank you for your feedback. On behalf of our entire team, I would like to apologize for not exceeding your expectations. Your satisfaction is important to us and we will be using the feedback you gave us to implement improvements to ensure we offer a better experience for guests in the future. Thank your for your compliments about our star employee Aaron. We are upgrading our rooms and lobby to serve you better. We are also in the process of upgrading our pillows. Customer Service is a priority with us here at Best Western Halton Hills. We would love to welcome you back and look forward to serving you in our newly renovated hotel. "Making effort to keep up todate and serve well"
An older property but it shows evidence that efforts are made to keep it excellent condition. this compensates for the need to park outside your door as was the style some years ago for motels. I would stay there again. I booked a room about 4 weeks ago by phoning the hotel directly. First off, Linda who I spoke to was quite rude and told me I would have to call back as she was on the other line with another customer. Poor service to start with and it only got worse. Three weeks afterwards my plans changed and I would not be needing the room after all. I was well within the 24 hour cancellation time frame being 3 weeks away until my actual booking. The problem lies with the refund they will not give me. They have charged my credit card and will not credit me back. I have called twice and emailed twice. Still no refund. Linda tells me they don't charge before you come for your stay, but they did. A mistake has happened on their part and they will not fix it. Next step is BW head office. I have also disputed the charge with Mastercard so hoping they come through for me. Would not recommend ever giving this hotel your credit card info unless you are there in person and only pay for what you get. We needed a pet friendly room and unfortunately one was not available. The front desk clerk, Linda, thought that the on-line bookings for the pet friendly rooms was a booking error. She took my name and phone number and called me when the clients arrived and announced that it was indeed an error and they did not need the room. Linda was very helpful and went out of her way to ensure that we had a room for the night. The room was clean and comfortable. Our only issue was the additional cost for our pet. It seamed a little high. Thank you for your kind compliment! We think it is a beautiful hotel as well. Prompt service, understanding and caring staff, and a good sleep! Thanks again for staying with us, we look forward to your return! "Service was excellent but a bit pricey for a motel"
The hotel staff were great! My wedding was the next day and I forgot to print off my speech and they did it for me quick and easy no questions no charge! I was very impressed. The breakfast is small but tasty. The rooms are normal.. nothing special. The price wasn't the greatest though... I have had way better rooms for less. And it is kind of like a motel style where the rooms are accessed outdoors. not a hotel. We are so happy our staff was able to assist you on your special day! Congratulations by the way! We were honoured to be your choice of hotel for your wedding as we know how important a quality stay is, especially on one of the most important days of your life! It is true though what you said about our hotel room door facing outwards. We chose to keep this style as it's retro feel is so very unique, private and fresh! We assure you though we are a proud member of the Best Western family of hotels. We hope you come back to good memories of your special day here with us. We are so grateful that you didn't fall, Pat! Please know that our front desk staff is trained to remind each guest of the step-down feature in our upper rooms; we have notices posted on the door as you enter and we do have the step boldly highlighted. Funny, many of our guests enjoy the upper rooms, as they find them cozy. Everyone has their favorite and unfortunately we can't always guarantee requested rooms. We remind our guests to please let us know at the time of booking (even through third party bookings) if mobility is an issue. We will make note of this need on their registration card. Our guests with limited mobility take precedence for our lower rooms. We welcome you back anytime Pat so that we can offer you again the warmth and care of Halton Hills! The location of the Best Western in Georgetown was great - near mall, grocery store - within walking distance. The room decor could use some updating but all and all we felt very comfortable here. The staff was very friendly and informative. "comfortable accommodation, clean, no bereavement rate"
We needed a place to stay due to a death in the family. The beds were comfortable, the room clean, everything worked (air conditioning, tv, shower, fan in the bathroom). The towels were plush and soft. Shampoo and soap provided. We didn't try the complimentary continental breakfast (6:30 am-9 am). The hotel is 2 floors. We were happy to stay on the ground floor as there is no elevator. The decor is neutral. We asked about a bereavement rate but none was available. There is lots of parking, if not by the room at least fairly close by - no charge. Guelph Street is Highway 7. It was mostly quiet, however, when a neighbouring room ran the bath or shower it was quite loud. Upgrades to include handicapped rooms & wheelchair accessibility is needed. Housekeeping staff made our stay more enjoyable although we chose not to have housekeeping services just asked for extra towels & coffee. Our stay at this hotel was very pleasant from all aspects and would return to this hotel without any hesitation. Very good staff, gave us a feeling of warm welcome and as if we were family.The breakfast area was very clean and all supplies and food items were there even towards the end of breakfast time which is very unusual with continental breakfast set up.The landscape and property are very clean and well maintained. The staff were very knowledgeable about their town and offered us a lot of nice suggestions of places to eat and see.Keep up the good work and service that you offer. 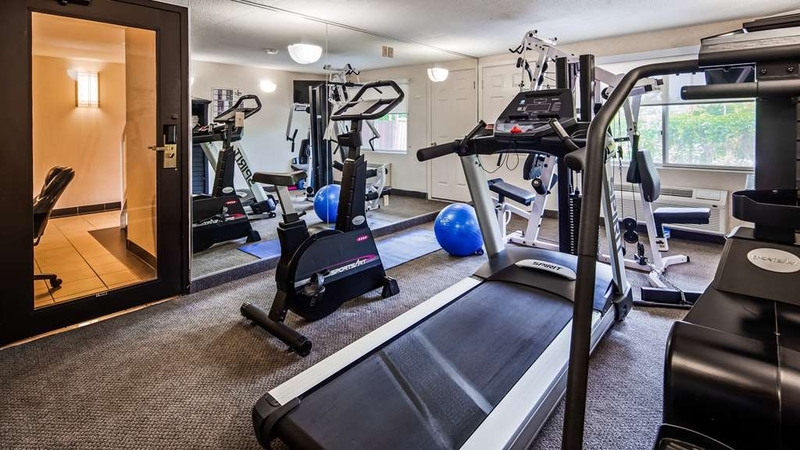 My wife used the gym facility and commented that it was very clean and safe.Normally gyms in hotels are dull and smelly but in this hotel it was kept very well. I came to the Best Western Georgetown after a long and exhausting bike trip from Tottenham. When I checked in, the front desk was very helpful in getting me checked in to the room I needed. The one King bedroom was very nice, room was well decorated, bed was very comfortable, and nice relaxing shower. The free wifi was very useful in assisting me to plan my trip for the next day. Also, breakfast was very delicious and offered a wide variety of tasty items. Upon checkout, front desk lady was very helpful in getting me signed for Best Western Rewards program. Overall, very pleasant and relaxing stay! Highly recommended!! 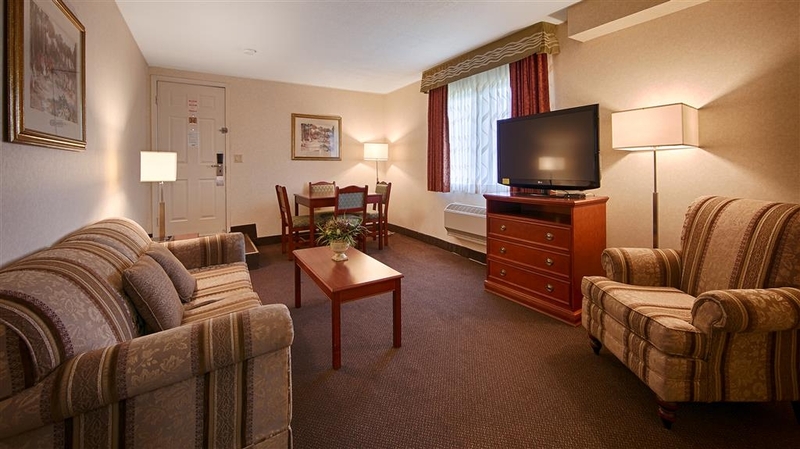 "A great stay at the Best Western Halton Hills, Georgetown, Ontario, Canada." A great stay at the Best Western Halton Hills, Georgetown, Ontario, Canada. Had a great sleep in the very comfortable bed. Very nice and helpful staff at the front desk during check in made my stay more enjoyable, and I would highly recommend this location. This hotel was wonderful, the staff at the front desk we're super pleasant and patient. The phones were ringing off the hook when we arrived to check in but he made sure he checked us in before answering the phone. Great customer service but I felt bad he couldn't answer the phones. I Hope everyone else will have as nice of a stay as my boyfriend and I had. Always a pleasure to stay here. The beds are sooo comfortable! The staff are kind and helpful. I look forward to my next stay. I noticed the workers installing new carpet in some rooms. :) The waffles were amazing as always, and the fruit makes me feel less guilty about eating the waffles. Great value for my $! "Clean, cozy and convenient, but shocked at what we witnessed"
We frequent the sports bar Shoeless Joe's (across the parking lot) and thought it may be a great hotel to stay at just for a change when we watch our Jays/Leafs games and want to have a few drinks. We live only 15 minutes away, so it's nothing for us to go there every week, so we thought to try it out and maybe make it the norm. We stayed here for one night, and today is the day after. After what we had witnessed, we are questioning the ethics of management and of Best Western's standards. To start, we called late in the afternoon to inquire about availability that same evening. Once we received the confirmation of availability and the cost, he said there were "6 kings left at $114", we informed the gentleman on the phone that we would call back in 5 minutes with the CC number. Almost immediately after, we called and after numerous attempts, someone finally picked-up almost 30 minutes later (we were just about ready to give up). In any case, we confirmed our booking, paid by CC, then hung up. We arrived at the hotel about an hour later to find a sign on the desk "be back in 5 minutes", so we waited. Front desk finally arrived about 15 minutes later. We checked in, went back to the car to grab our bags, walked into the lobby, wanted to ask for the wi-fi password, but again, there was no one in sight and the "be back in 5" sign was back up. A couple of hours later, we headed to the restaurant across the parking lot (once again no one at the desk) and had dinner and drinks. We happened to see the front desk gentleman sitting at the bar, thought nothing of it (thought he was done for the day), said hi then carried on. After dinner, walked back through the lobby and there was an elderly woman with a walker, barefoot (pants almost falling off) and she anxiously looking for someone. We proceeded to our room then began to hear her banging on the counter. That's when we thought we should ask if she wanted help. We walked back to her and she said she had been waiting for 20 minutes. A minute later later, that same front desk guy who checked us in and who we just said hi to while sitting at the bar shows up with a portable phone in his hand and asked the lady what she needed, then we hear "oh, you locked yourself out again". We went back to our room. Minutes later while we were out on the balcony near our room, we watched as the front desk guy headed back to the bar, with phone in his hand. Are you kidding me? He left the premises and has been leaving his station without anyone tending to the guests or the hotel? We were floored. What if there had been an emergency? Unacceptable!!!! In addition to all of this, we were charged $158, after being quoted $114, directed our concern to this same gentleman earlier, and he said "oh, we can't do anything about this, it was someone else who quoted you and he is gone for the day". Seriously? I doubt we will be coming back if this is how they value their customers. Too bad, the room was cozy and clean, and we would have loved this to be a frequent easy get away. We will be reporting this to head office. Thank you very much Tess for bringing this to our attention! We too have been shocked by your report. We want you to know that we have indeed corrected the situation so it will not happen again. We run a family friendly hotel, one in which we pride ourselves on our customer service. We deeply apologize for this happening to you and to any other guests. We are very happy though that you found our rooms to be cozy and clean! Our housekeeping staff go above and beyond to ensure the cleanliness of our quaint hotel. It is true that our location offers great opportunities for friends and family to gather to celebrate or just plain hang out at one of our local establishments. We hope that you will return to find the outstanding level customer service that we have been known for. "In need of renovations. More like a motel"
We stayed here for one night even though we had read not so good reviews as it is very close to where my son and new granddaughter live. The decor is quite tired, the carpet not so clean and almost no water pressure from the shower. On the good side the staff was nice, the beds comfy and sheets clean and the (free) breakfast offered a lot of variety. Overall, next time we will travel a bit further for a nicer hotel at almost the same price. Hopefully they will renovate soon as we visit almost once a month. We always appreciate feedback on our little hotel. 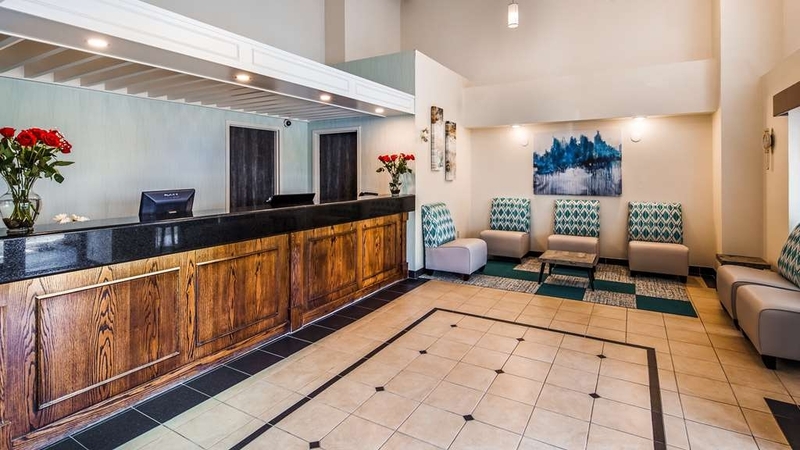 Many enjoy the ability to drive up and park in front of their room and not have go through a lobby, so it's true, it does have a familiar motel feel to it. We do ensure though that we are indeed a proud member of the Best Western Family of Hotels. As for renovations, we have been working diligently and quietly, upgrading room by room as not to disturb our guests' experience. We will be complete soon so please don't hesitate to come and stay with us once again. Our housekeeping staff have done an outstanding job at ensuring the highest level of cleanliness and there is nothing better than a comfy bed with nice crisp sheets! We are glad we could offer you such an experience and yes, we have made special effort on our breakfast bar:) Once again, thank you for your important feedback and we do hope that you will come back and appreciate the uniqueness of our distinct hotel. Not the most friendly receptionist I've encountered. Service wasn't up to standard in my opinion. Rooms were average - nothing spectacular - but a bit over priced. Would most likely find another place to stay next time I'm in town. Charyn, Thank you for your review, your concern has been reviewed. We are disappointed that we did not serve you up to your standard and that you did not find value in our location. We stride for our prices to be competitive for our local market, a price review is under consideration. We hope you think of us the next time you are in the area to see our improvements. I have stayed many times at this hotel due to work and proximity but over the years, with new management and especially the lady in front are not very helpful or welcoming. Rates are inconsistent, sometimes I pay $150 for a weekday and then sometimes $117 for a Friday. Any questions, and the lady in front gets agitated and seems happy not to take my business. And that's exactly what they are getting moving forward - not my business. Sorry Best Western - you guys are on a down hill slope. Maria, We would like to first thank you for your many years of business at our location. Secondly I would also like to thank you for your feedback as it is the best way to measure our level of service. I understand your frustration with the changing rates depending on the type of room, date and availability the rate can vary. In regards to our front desk staff we addressed the importance of welcoming our guests. We welcome you to come in for another stay. "Only hotel in town; ok place to sleep"
I have been coming to this hotel for many years on business in G'town. The hotel is the only one in town, and while the rooms are modest, they are decent. There are no elevators, but there rooms on the second floor. 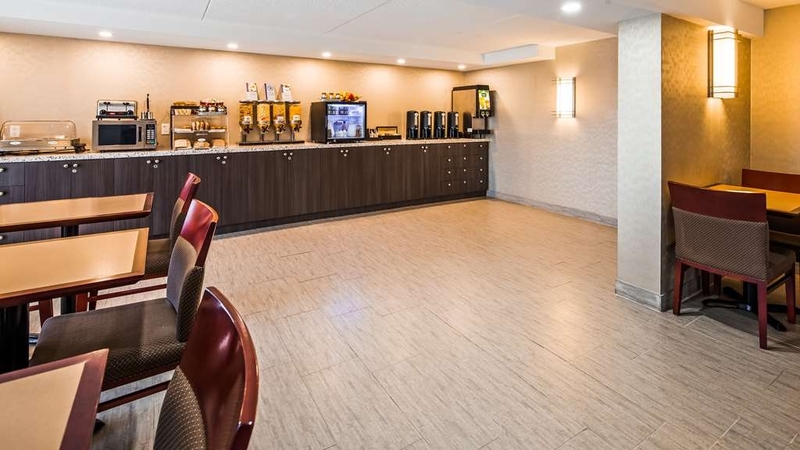 24 hour front desk , and free breakfast (some cereals, store bought pastries, and malted waffles, along with coffee and juice) are some of the amenities. TV programming is good. Some rooms have mini-fridges and microwaves, but not all. Furniture and fixtures are mid 80s standard hotel quality material. The staff are always nice and helpful. The rooms sometimes have some bugs in them (due to the hotel's somewhat rural location) Ample parking there, and there is a Shoeless Joe's diner only a few meters away in the car park. If you only need a place to sleep, this will do. Thank you for your feedback, your business is very important to us and we value your comments. We always use feedback to improve service and guest experience. We welcome you to join us again thank you for your many years of business. "Expecting a little better for Best Western!" I have stayed in a few Best Westerns in North America. This one is not up to the standard that I have seen. Confusion at the front desk at on what rate they were going to give me. It sounded promising but didn't end up that way. I was just another customer. I think they realize that there isn't much for hotels in this area so why should they give me a good contractor rate. I get it! The room was clean! Value just not there but it is what it is! Thank you for your review. We are happy that your interactions with our staff was pleasant and we stride to make all our guests feel welcome. Yes each room gets to control their temperature and has free access to our Wifi network. When it comes to our complementary centennial breakfast we have been getting positive feedback. We welcome you to stay with us again in the future. "Truck Stop Motel - Stay Elsewhere!" I went with a team and so the goal was to stay with the other kids and families. If you have no choice - you can stay here. If you have a choice - stay elsewhere. It's a dump! Booking was a mess - with lower rates on the site not honoured, multiple calls needed and an eventual expensive rate! The rate actually went up while I was on the phone! They said too bad - we're filling up so you can pay the higher amount or nothing. Because of the team, I paid. But I expected a reasonable hotel, a decent room, a pool for the kids, a nice breakfast.... You'll get none of that! Dumpy, dirty roadside motel with rooms to match. Keys that don't work. The most pathetic breakfast I've seen. No pool. We had fun as a group - so all good. The Shoeless Joes in the parking lot is a handy option. But I won't be back unless I'm forced again! Steve M Steve we can understand your frustration with the discrepancy between the rates found on third party websites and what was quoted over the phone. Booking online makes for an easier booking and comparisons between hotels. The caveat to booking online is the loss of flexibility in regards to changes and cancelations without refund. At our property for example, if you were to book with us you can cancel your booking without penalty until 4pm of the date of arrival. We take pride in our property, we maybe an older looking building but our rooms are clean. You are correct, as indicated on our website, we do not have a pool but we have a state of the art fitness centre. . We would welcome feedback for additions to our complementary continental breakfast options. Going forward our front desk staff have been informed of the importance of accuracy of programming room cards, and educating callers of the benefits of booking with us directly. We are going to stride to fix and learn from this situation so that you and others will have a better stay with us in the future. Reserved a room on the Best Western website and the hotel would not honour the rate quoted. I took the room and spoke to management the following morning. They were terrible, I just accepted the rate and paid the bill. I will never stay at another Best Western. Jacqueline we can understand your frustration with the discrepancy between the rates found on third party websites, some of which resemble the Best Western website. Once a booking comes in as a guaranteed hold we do not have the ability to adjust the rate. Rate discrepancy found online is an issue brought to attention already and we are working towards resolving the problem. We stayed here on a whim as our plans fell through. Our cost for the night was a $180.00!!! Imagine my disapointment, when I wanted to have a simply bath before going to dinner. The plug didn't work. We called and they sent someone but he didn't have a clue how to fix it. Next morning I can hardly wait to have a shower. Imagine NO HOT WATER!!!! NONE!!! We told the front desk and they admitted they have a problem and that was it. Nice of them. If you want to stay here, bring some fresh wipes! We reviewed our maintenance log and noticed the service call was made late in the evening. Our full-time maintenance man works until 5pm and we understand your disappointment with the evening student not knowing how to fix it. 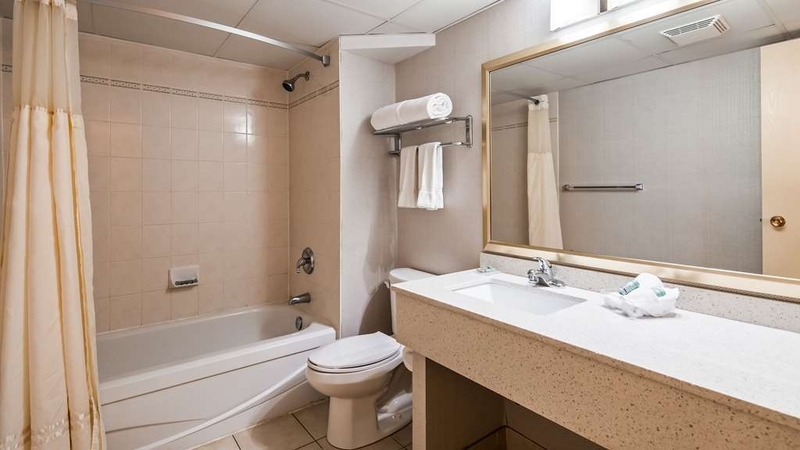 Going forward we added an extra item in our room audit check list to ensure that bath tub plugs are in working order so that this situation does not occur again. We understand that hot water is a basic need for our guests. We had scheduled the replacement of both water heaters overnight in an attempt to minimize the disturbance to our guests. Unfortunately the crew hired were not able to complete the work before guests woke up, and we too are upset about that situation. We can assure you that we will not have hot water issues for some time now because of the new units installed. We booked this hotel as the closest to Acton, Ontario where our son and his family had moved to. It was very nice, clean & comfortable, so we booked a 2nd night while the family was unpacking at their new home. Initially, the cable was out in the area, but the staff (Antonio) gave us good service in initially trying to fix it and then advising that the problem was with the cable company. We went out and when we came back it was fixed. We welcome your son and family to our community! Acton and Georgetown are a part of Halton Hills and is an awesome (and safe) place to raise a family. Antonio, our Front Desk Clerk is a whiz at problem solving so we are happy to hear he was able to find answers for you. We hope that you will come and stay with us again next time you are visiting and have another great night rest!! Stay here for a couple of days. The room it's self was fine, however our door lock on night stopped working and we were locked out. The staff said they had no idea how to fix it and if we were to go out we had to be back by 10pm as there was no one duty from 10pm, Staff are lacking in basic maintenance training and why is no one on duty during the night! We so apologize for the great inconvenience this maintenance issue caused you! Our excellent Maintenance man had been injured and was recuperating. As we aim for the best security possible for our guests the lock system can be complicated. We again apologize and will review any overnight discrepancies. There was a centipede in the sink. The sound is so bad you can hear the person in the next room coughing. Mattress was lumpy. Old old old.... never updated for dozens of years. Room opens up to outside walkway... people stop and look right in your window!!! We contacted Best Western Customer Care and never receieved a reply from the manager. Do yourself a huge favor and stay away from this ugly sad place! We are saddened to hear of your displeasure with our quaint hotel. So many returning guests appreciate the comfortable stay and enjoy the outdoor access, especially when the flowers are in bloom! The summer brings insects for sure, in our homes and in the business, and they especially like drains. We want to ensure you that we take every measure to manage those little pesks! And we are sorry to hear of that you had no response, very unlike our management! Please call them again as they may have missed your call. We want to address your concerns and truly hope you will give us another chance to show you what a great little gem we have here in Georgetown. Stopped over in Georgetown after a day in Toronto. Surprised to find that the hotel was booked because of a Microsoft Convention in Toronto. Staff was welcoming,and provided directions and suggestions for the local area. Our room was clean, but missing towels, they brought them right away when called. Thank you for spending a night with us! As we are close to Toronto so we often have guests from the big city who appreciate some small town hospitality! We are glad to hear our staff were quick to respond and were able to highlight and direct you to some of the great sights and sounds of the Hills of Halton. We hope you come back again! I have stayed at this location many time, I have never encountered any problems, room always clean and neat. The staff always helpful and cheerful. The manager goes out of his way to make your stay a pleasure. Would recommend this hotel to all. Ah, thanks!! We so appreciate your feedback because we want our wonderful staff to know that their work is appreciated not only by us but also by our valued guests. 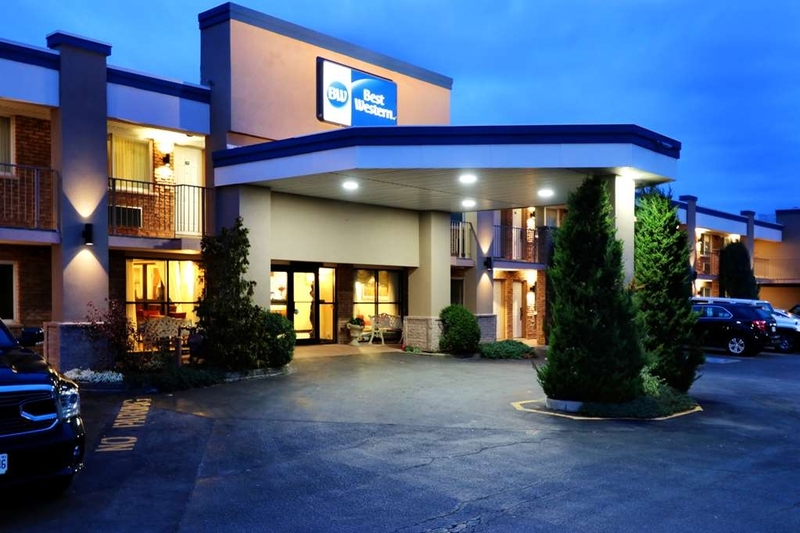 We look forward to serving you again here Best Western Inn on the Hill. I stayed at this hotel during a quick business trip. I have stayed here before and the staff are always welcoming, room is clean, all necessary amenities are available. That's all I want/need and the price is very reasonable. "Quality and Value tucked in right off the main road." Tucked away just behind one of the local bar/restaurants, the Best Western is one of the few places to stay while in Georgetown. It is well located as it is not far from Norval, Acton, Limehouse and Glen Williams. The owners are friendly and community oriented and they keep the place spotlessly clean and comfortable. The service is great, everyone is helpful and very knowledgeable about the surrounding area. If you're looking for comfort and convenience - look no futrther. "day saff and service were excellent, night staff......not so much." The room was adequate and what I expected for the price. The day staff were amazing, helpful, welcoming accommodating and friendly. The evenings did not go so well, there were people in lawn chairs drinking in the parking lot in the evenings, and the night staff were no where to be found when I needed assistance with my card late one evening. I was not comfortable at all in the evenings. I think the management should not allow large gatherings of people drinking in the parking lots where guests enter and exit their rooms, as a single women I felt very uncomfortable coming in both nights. The folks were not extremely loud or rude, but I feel they should have gone to a pub, or somewhere else for their evening libations. Stayed at this hotel for one night. Bed was comfortable, and though the pillows were small, there were four of them, and they were just the firmness I like. Room was clean, and the staff was friendly. Breakfast was a nice variety. Will stay there again. Thank you for staying with us at Best Western Inn on the Hill. We are pleased that you had a comfortable stay and that you enjoyed our breakfast, we aim to provide our guests with fresh and healthy selections! We truly have great staff, they are friendly and efficient!! We look forward to your next visit. "Best service, friendly staff, clean and perfect location"
I highly recommend this facility for anyone wanting to stay in a friendly home away from home environment. This location is perfect for business people and also for families. The Management is very helpful and staff are well trained. Wow, thank you! We are a friendly lot for sure - glad you were able to enjoy your stay. We appreciate your invitation to families as well a business travelers; we too think that we have great facilities to accommodate all people as they journey. Hope you are passing this way again, we will be happy to have you back! "I don't get all the bad reviews...."
Well, I don't get why this place is rated 3-star. Like, I don't get it AT ALL. I suspect it has something to do with the fact that it's a motel, and it's in a small town on the only highway. But I want to go on the record as saying that I feel that anything less than 4 stars is unfair. I booked here because, frankly, I couldn't find anything else. I read the reviews and braced myself for a crap experience, reminded myself that it was only for one night. So... whatever, I figured. The surprises began at reception, when I checked in. Big smiles, big welcome, offers of coffee and water and did I need a taxi anywhere? The second surprise happened in my room, when I walked in. I thoroughly expected a run-down, slightly-unclean room, maybe a kettle if I was lucky... and I got none of that. Spotless floor and sheets and washroom. A great little coffee machine. Fragrant soap and shampoo. A functional hair dryer. Free wifi. Large towels. And it was quiet - so incredible quiet. And I was next to the stairs! The next morning, when I went to check out, I got my final surprise. My husband had booked a second night for me by accident, and it was a 'non-refundable' booking. I was annoyed, but figured that I'd have to just eat the cost. But the manager told me that he'd cancel my reservation, at no charge at all! It was so kind of him, and I didn't expect it; I certainly didn't ask. He offered, and it was great customer service. OK, it's not The Ritz. It's a highway motel. But it's the best motel that I've ever stayed in, and no lie. I have no clue why it's getting bad press, because I don't see why it should. Great staff, clean rooms, above-average amenities, ideal location. A solid 4 stars from me, with 5 stars in some areas, like cleanliness and staff. We love it when our guests are surprised! Our aim is to offer warm and friendly service with a home like feel. We invite all to our small and lovely little hotel! 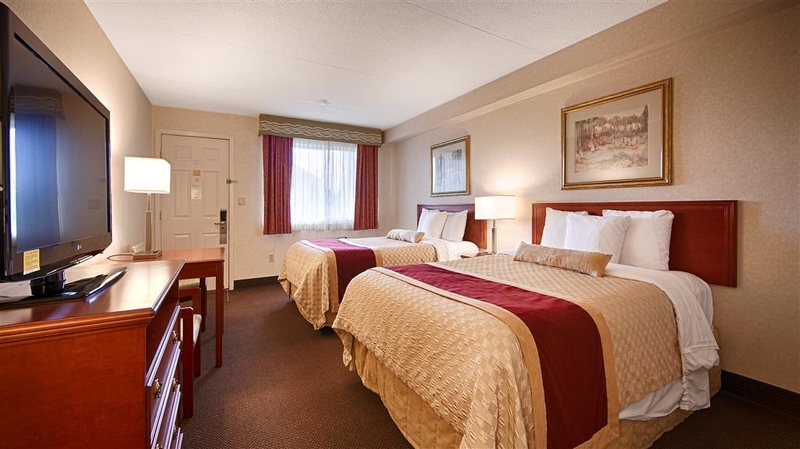 Please come back when you are looking for a quiet break, we await your next visit to Best Western Inn on the Hill! Have stayed at BW Georgetown many time, have never had a problem. Rooms are spacious and always clean. Staff is always cheerful and willing to help. Plenty of shopping and places to eat near by. Highly recommend. Georgetown is a beautiful little town and Best Western Inn on the Hill is proud to be apart of this charmed community! It doesn't matter the season, our large windows look out upon the many trees of the Niagara Escarpment and our spacious rooms are invitation to all to relax and enjoy their time. Thank you for sharing your experience and we look forward to your return. Stayed one night. Check in and out was handled quickly and efficiently.Very clean and fairly quiet considering it was sold out. One obnoxious guy at front desk was handled well by the staff. The beds were comfortable. Continental breakfast was fine. Our well trained staff really can manage a full house and to quietly take care of those who need a little extra tlc. We are glad you had a comfortable sleep, and it is true, we really do have cozy beds! Our complimentary continental breakfast continues to expand and we hope you have an opportunity to stay with us again soon so that you can experience it in its fullness! Thank you for taking time to share your thoughts. "Very Good Hotel-Outside needs a little work." Pleasant stay, we were there for a wedding. Check in was great, staff was friendly. Room layout, decor, comfort and cleanliness were perfect. Outside needs a little attention. We were on the second floor and part of the metal on the balcony was separating from the concrete. Overall, a very good stay. "Clean hotel with basic amenities"
This hotel was very clean and the staff was friendly. Rooms are small it was fine for what we needed. Pillows are small but the bed was comfortable. Breakfast was good but options were limited when it came to fresh fruit. Good value for what we paid. Dear Allison F, Thank you for taking the time to share your experience, we appreciate your kind words in regarding the fast and quality service. Once again we would like to thank you for you for referring our hotel and hope to see you very soon! "When we needed help the most"
Dear Laura D, We are delighted to hear that you enjoyed your stay with us (sorry to hear about the house fire). We would like to thank you for your comments about the great service you have received from the Manager Linda and the rest of the team. We have happy that they helped you in the best way possible. Standard room, but a large bathroom made it a bit special. Good location along the main strip in Georgetown. There is no indoor corridor to get to the breakfast (free) room, so you need to put on good shoes and a sweater in winter. Breakfast starts at 6 on weekdays, but only 7 on weekends. The night clerk made coffee for me earlier as I was letting my wife sleep in. Dear Glammis, Our team would like to thank you for choosing our hotel when you have so many choices. 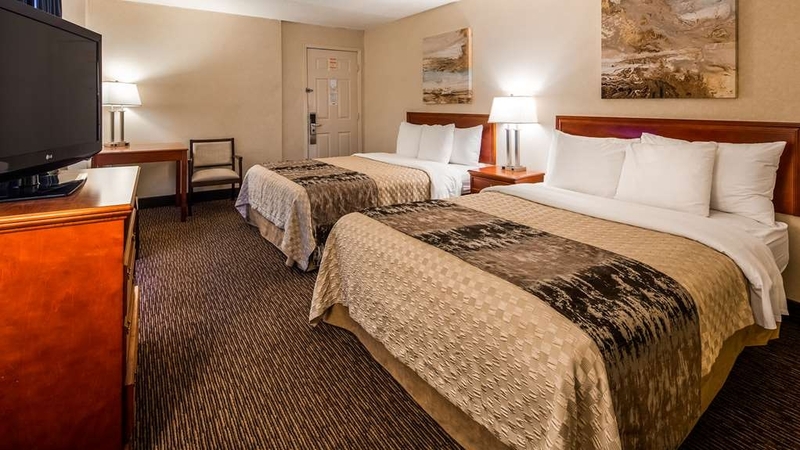 We appreciate your compliments about the location and great service at the Best Western Inn on the Hill. We are also happy that the night clerk did her best to make you feel comfortable. Your comfort is our priority! I stayed at this hotel with 3 other friends for new years eve. As with everyone else staying at this hotel everyone went down to nashville north for the night. On our return we met up with a few other guests at the hotel and carried on the party in our room. Around 330 hotel staff came to tell us it was time to quiet down and extra people had to leave the room. So we abided by their request and sent everyone packing and we went to bed. Upon checkout i was charged an extra $90 for extra people in my rooms even though we didnt have more then 2 people stay in a room. So in response i called best western corporate office to lodge a complaint. Corporate then called the hotel to get their side of the story but with no response. A week went by and i had to call again to see what was going on, they attempted to call the hotel again but to no avail. Another few days go by and I call again, and finally I am told I will have a response within the hour. Finally I have the response which says -330 a security round was conducted and found we had extra people and were told to send everyone back to their rooms (which we followed) -I'm also a platinum member with best western rewards. I was told that i was awarded points for both of my rooms (I had to call corporate as well because they would only reward me points for one room, and stated I only had 1 room booked.) -I was told I have never stayed at this location before (yes I have, which i mentionned upon check in) -I was told they were curteuous by not charging me for a late checkout (i checked out at 11;02 because i was waiting in line, and the front desk lady was too busy being rude to me as well she didn't know how to take money away from my deposit) I have since responded to the email, and 3 days later have yet to receive a response. So i called the hotel and asked to speak to the manager, they asked for my name in which i told them. Immediately I was given an uhhh ohhhh she just had to step out for an appointment. In response to this I called corporate again who then reached out to the hotel once again and low and behold they were able to talk to the person I was trying to speak with. I was then advised that the hotel will not refund my money and there is nothing I can do about it. So now I am left with a $90 charge, a hotel who doesn't have the professionalism to respond to an email or answer my phone call, and a corporate customer care that won't do anything. As someone who stayed in a best western hotel for almost a month of the last year you would think they would do something to keep me as a customer, but no they are treating me like this. Thank you for taking the time to share your experience. On New Years Eve we have to make sure that all our guests enjoy a quiet and restful stay. We do perform security rounds to ensure that all our guests are safe and also respecting other guests who are sleeping. "Front desk staff = Best Part"
Dear Cindy T, Thank you very much for your kind comments about the service you have received from our great team. We will take your suggestions for future guests. We would also like to thank you for your kind words about Allison, and we are happy that she helped you in the best way possible. This hotel is always clean, Staff is always friendly and helpful. Will look up information if not known. The location is good. Restaurant's close by. Convenient to shopping. When needing to stay in Georgetown area this hotel will be the one I would always choose, as long as they keep up the quality of service. Not many motels in Georgetown, but this one was recommended to us and has been around for years according to the locals. Nicely renovated and clean rooms. Had a quiet sleep on their comfortable beds There is a continental breakfast included, which is standard fare. Lots of parking. Our friends from Georgetown were impressed with room. When I checkin, I was asked to pay instead of deposit, and the guy working for this Hotel told me they don't offer the invoice which I am going to stay this motel level Best Western. Personally not recommend this MOTEL to people. Their room smelt so bad, wet room is so small, beds are double beds instead of the Queen size which is the Best Western standard. We have four people in the reservation, but only three bath towels in the room. No coffee bar is refilled, and breakfast room is tiny small without sausages and enough food in the morning. Very bad experience. Great personal service; clerk showed me to my room and ensured my A/C was on and right temperature......hotel is on the main street, but very quiet...A few restaurants are close by. Also a few strip malls for any shopping..
Dear Gordon H, We are so glad to see you were happy with your experience at the Best Western Inn on the Hill in scenic Georgetown/Halton Hills, Ontario. We strive to provide value through maintaining a conveniently located clean and quiet facility as well as providing genuine caring customer service. "Best beds ever, quiet and close to the GTA"
I was quite amazed at how close this location is to the Greater Toronto Area. The beds are unbelievably comfortable, My daughters and I slept like a rock! It's set back from the main highway and therefore very quiet with a double floor and one level of drive up rooms. Well done Best Western, I will definitely keep this hotel on my radar. A pool and slide would be the only suggestion I could think of. Bravo! Dear Steven H, It is wonderful that you enjoyed every part of your stay at our comfortable hotel. We love to hear that we have given a guest so many reasons to return to our establishment. It is very gratifying to get comments like yours. We will be sharing it with members of our team to let them know what a great job they are doing. Stayed here for a wedding August 2015. Breakfast was included, lots of choices. Staff very polite. Received a room upgrade which was not needed but a great bonus. 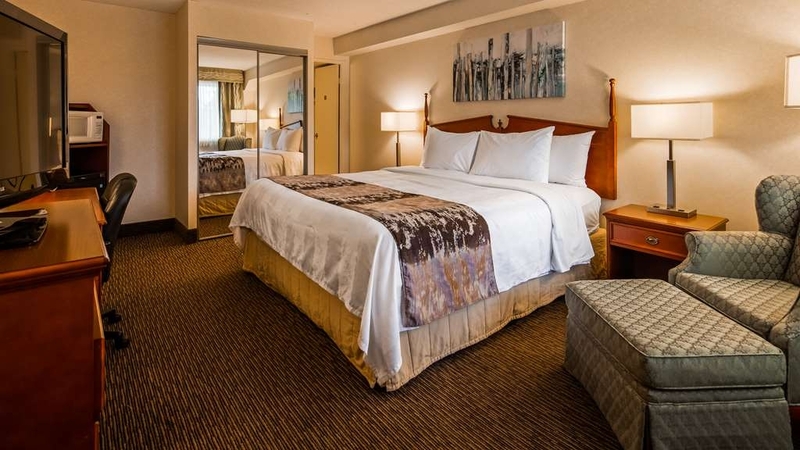 Comfortable king size bed and many easily accessible outlets for recharging devices! Dear nicolaj584, Thank you for staying at the Best Western Inn on the Hill recently! We would like to thank you for taking the time to write a review and recognizing our staff. Our staff pride themselves in providing the best service possible to all of our guests. We are glad that we could accommodate you during your wedding, and we hope that your experience here was a great one! We hope to see you again soon in Georgetown!